During prolonged, extreme cold spells, any water service is at risk of freezing, but there are certain risk factors to be aware of. Knowing when the risks are high can help building owners take preventative steps to protect their pipes from freezing. Depth of service: the deeper the pipe is installed, the safer it is from freezing. 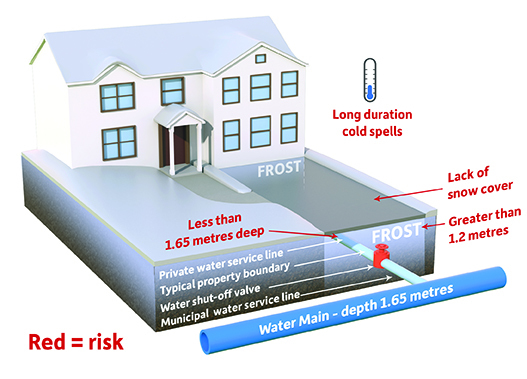 If your water service line is installed less than 1.7 metres deep, it’s at an increased risk of freezing. Frost: The deeper the frost, the higher the risk. We consider frost depth greater than 1.2 metres or four feet to be a risk factor. The areas underneath and around driveways, catch basins and foundation walls are more frost-prone. Therefore, if your water service line is installed underneath or along these areas, it’s at a higher risk of freezing during extreme and prolonged cold spells. Be aware that traffic can also drive frost deeper into the ground. Lack of snow cover: snow acts as an insulator. Where pipes run underneath areas that lack snow cover (such as driveways) they are at increased risk of freezing. Temperature: When outside temperatures fall below freezing degrees for several days or weeks at a time, pipes may be at risk of freezing. This depends on other risk factors such as frost penetration, snow cover and duration of the cold spell. Know when risk factors are high for service lines freezing. Then check out our tips to help prevent this issue from happening to your home. The above are some of the factors that can contribute to the water service line freezing. Did you know that your internal plumbing pipes can also be at risk of freezing? Factors like unheated spaces and poor insulation contribute. Visit our page on preventative tips to learn how to protect your indoor plumbing.